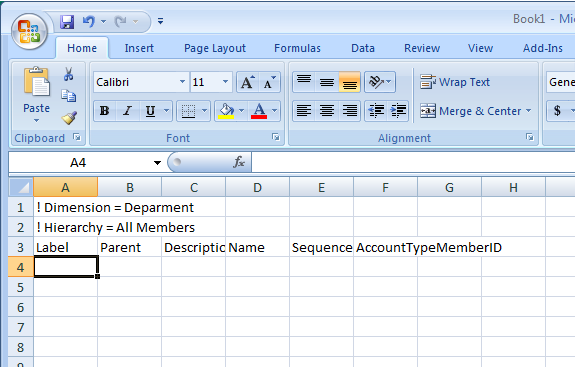 When you create dimensions in PerformancePoint Server you have an option to create a dimension from a csv file. This sounds like a great way to kick start your dimensions because you can take a csv file with data and upload it to create a dimension and have it populated with some data. Great idea, but only if you know the format of the csv file. The first 2 rows are header records that must be there to define the dimension and hierarchy before you list the column headers. If you have data, go ahead and add it in, so you create the dimension you can also have it import your data to give you a head start. This entry was posted in PeformancePoint Server 2007 and tagged Comma Separated Value, Data, Data Formats, Databases, dimensions, File Management, File Systems, Microsoft Excel, PerformancePoint Server. Bookmark the permalink.